The 4th of July can be a wonderful time. I mean, we have cookouts and get to hang out with friends and family. But for our pets, it can one of the most stressful days of the year due to the loud booms and flashes of fireworks. These unusual sights and sounds can terrify them, which can often result in unusual behavior on their part such as pacing, whimpering, or even running off if they’re outside. 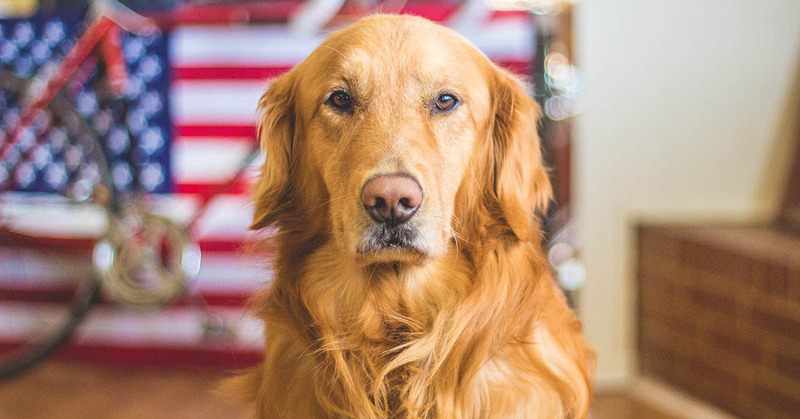 Because of that, we’ve put together some of our favorite tips and strategies for keeping our pets calm and safe during our 4th of July celebrations. If your dog can handle walks during the summer, going for one early in the day before all the fireworks start is a great way for them to burn off some energy. A tired dog may naturally be more calm later on in the day, which can help them to relax in the evening. Going for an early walk is especially important if they’re used to daily walks. I wouldn’t recommend walking later on when fireworks are likely going off as this can cause even a well-trained dog to pull, cower, or run off. Encourage your dog to do his business outside before the fireworks get too crazy. Forcing them to go outside when fireworks are going off will usually cause them to become even more scared, even if they don’t show it with the usual signs of distress you would expect. Close the curtains and blinds and turn on some music or the television to drown out some of the booms from outside. You can also create a den in a quiet and peaceful part of your home using their bed and their favorite blanket for them to retreat to if they get scared. Letting them cuddle with one of your unwashed shirts from the hamper can also help them feel safe due to your scent. We all want to spend time with our dogs and include them in our celebrations. But during the 4th of July it’s best for them if they stay home while you go to a fireworks display or cookout. Dogs can become terrified and distressed and display that anxiety in many different ways. Even a dog that doesn’t whimper and pant can be spooked and run off. It’s safer for your pets and everyone else around if they stay home. Your dog can pick up on your mood and it can rub off on her. Try to stay calm yourself during the 4th of July. Instead of scolding them for barking or unusual behavior, speak gently and reassure them that everything is ok. Try to go about your day and evening as normal. Giving them something to do while fireworks are going off can help to distract them and use up some of their leftover energy. I recommend offering them a longer lasting chew as opposed to something like a bully stick that might not last as long. Don’t forget to give them a chew or bone that is appropriate for them and their level of aggressiveness when chewing. And as always, never give your dog rawhide. If you know your dog or cat has anxiety during thunderstorms and fireworks, you might also consider using an herbal calming remedy along with the strategies above. These are convenient to give and very effective for most dogs and cats. We carry them in our store as treats, capsules, liquids, and powders. They’re natural, safe, and don’t contain any weird chemicals or drugs. If you’re using one of these, give it to them at least an hour before the fireworks start up in your neighborhood so that it can start working in their system. Depending on the product, you may be able to give them a couple doses throughout the day. Please remember to always carefully read and follow the instructions for any supplement that you give your pet, even if it’s natural and herbal.